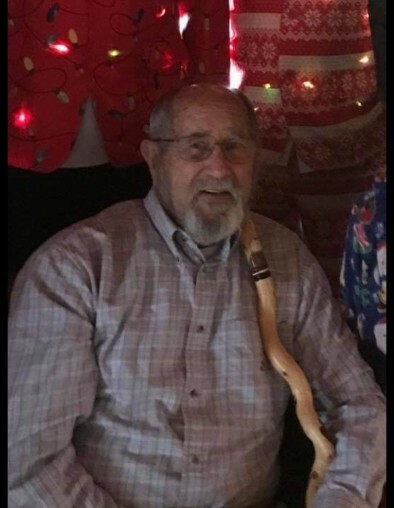 Darrell E. “Dee” Lucas, 85, of Bethesda, Ohio passed away at his home, January 26, 2019. Born March 22, 1933 in Bethesda, Ohio, he was the son of the late Delbert V. Lucas and Edna Travis Lucas. Dee’s memory will be cherished always by those he leaves behind; daughters, Kathi (Charles) Little, Melinda (Scott) Blake all of Bethesda, Ohio; sons, Stephen (Susie) Lucas, Vince (Kelli) Lucas all of Bethesda, Ohio; seven grandchildren; seven great-grandchildren; and sister, Genevieve Armstrong of Barnesville, Ohio. A lifelong resident of Bethesda, Dee enjoyed the outdoors, fishing, and hunting. He was a member of The American Legion of Bethesda Post 90 and The Bethesda/Barnesville Sportsman Club. He enjoyed watching youth and high school sports games and especially watching his grandchildren’s games. Dee had a talent for making many different canes for himself, as well as sharing the canes he made with family and friends. He enjoyed playing cards. Dee’s love for his family, especially his grandchildren, was the compass the guided him and gave him inspiration. He proudly served his county in the United States Army. Family and friends are invited for visitation, Monday, January 28th from 4:00-8:00 pm, Patron Funeral Homes & Crematory Kelly Kemp Braido, 322 N. Main Street, Bethesda, Ohio, where the service for Dee will be conducted, Tuesday, January 29th at 11 am. Reverend John Jackson officiating. Interment will follow at Bethesda Methodist Cemetery, Bethesda, Ohio. Those wishing to share their prayers, memories, or condolences, please visit: patronfuneralhomesandcrematory.com.